Mr. Crocker-Harris on his last day of school. Warning: Do not see this movie without tissue, and never ever see it if you’re feeling down. We know you won’t believe us when you do start to watch it. The language is about as stuffy as it gets, and the main character seems intolerably rigid and insensitive. It’s an old British movie, after all; how emotional can it possibly be? But you’ll soon be sucked in. 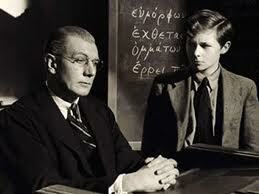 You’ll learn that even though it’s the last day of classes before the summer holiday, school master Andrew Crocker-Harris (Michael Redgrave) is as strict with his students as he has been all year. It’s the last day of school, for Pete’s sake! Lighten up! Then we meet Crocker-Harris’ wife (Jean Trent), a woman with stylish dresses and a strange haircut. Look at how charming she is with the other faculty – especially with a certain science teacher (Nigel Patrick). But we can’t really blame her for this indiscretion, can we? After all, she is married to the likes of Crocker-Harris, a cold figure with outdated speech patterns. However. This is a movie of layers and, as each one is lifted away, we discover that no one is quite as they seem. Then a student by the name of Taplow gives Crocker-Harris a book, the Robert Browning translation of Agamemnon, by the ancient Greek playwright Aeschylus. We (as in yours truly) don’t have a clue what this book is about, but it doesn’t matter. You’d better have the tissue handy at this point. Don’t say we didn’t warn you. We know you’ll like The Browning Version. It’s one of those movies that makes you feel smarter and more literary. Not that you aren’t already smart and literary. 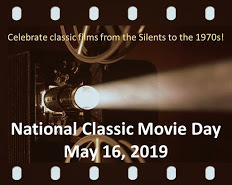 Starring Michael Redgrave, Jean Kent and Nigel Patrick. Written by Terence Rattigan. Directed by Anthony Asquith. Janus Films, 1951, 90 mins.